Twelve Pieces by Twelve Previously Exhibited Photographers are on display at the Emon Photo Gallery. Perhaps you can say that there are two types of people in the world – those who like to dive into a single venture head on and those who prefer to try out a little bit of everything first. If you have a penchant for the latter, then you would appreciate the photography exhibit at the Emon Photo Gallery. Consisting simply of twelve works by twelve photographers exhibited at the gallery within the past two and a half years, the exhibition is a very concise introduction to the work of these Tokyo-based artists. Some of the works stand out more than others. 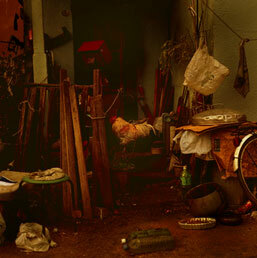 With a rooster at the center of the image, surrounded by the detritus of living, the mood of the Naoki Nishiyama’s work conjures up a sense of nostalgia about a certain place, even if one hasn’t experienced it for oneself. The reddish sepia hue of the photograph even pushes the image towards looking like a painting. Meanwhile, Nils-Udo’s The Nest has an ominous feel to it. Looking at this black and white print of a naked figure curled up inside an abnormally huge nest within a forest, one comes away with chilling feelings of vulnerability and helplessness. While my overall impression of the exhibit was positive, there were a couple of pieces that seemed to let the show down. Kisei Kobayashi has exhibited a diptych of a flowery tree or shrub against a clear blue background and an unfocused shot of a firecracker against a cloudy sky. The work had a bland retro feel, reminiscent little more than the kind of advertising posters you would find in the information center somewhere, anywhere. Osamu Yokonami’s piece features two prints of a naked baby boy seen from the waist down, one with an erection and the other without. With no context in which to assess this artist’s themes or ideas, it is a little difficult to know what to make of these images, and for some the content may prove a little too upfront. As an exhibition that introduces these artists’ works one by one, it certainly is concise, but equally it can feel restricted. We can only sample the artist’s work and even then, only the results of the director’s choice. To enjoy this exhibition, one needs to accept it as a starting point: somewhere where one might end up being drawn into the work of an individual or two, and inspired to find out more about each one’s technique and direction through one’s own research.